The island, Alonissos draws many visitors who come to swim in its clean emerald waters, dine on lobster, walk on its many forest paths and see the rare Mediterranean Monk seal as it’s one of the few remaining habitats of this endangered species. The Academy, which is directed by the multi-awarded and highly recognized Professor George Vithoulkas, opened its doors in the early 90s. We had both heard about the internationally acclaimed Greek homeopath and the Alternative Nobel Prize (Right Livelihood Award) he was honored with in 1996 ‘for upgrading Classical Homeopathy to the standard of a science’, and being fans of homeopathy and complementary medicine overall we were thrilled to find that right there on Alonissos we had the opportunity to visit the Academy and meet the Professor himself. So what brought you Alonissos? I came here in the late sixties to seek out a man whom I had been told was very wise. I found him and we talked; he asked me what I did, and I thought to myself oh here I go again, I will have to explain what homeopathy is to a shepherd, but as soon as I told him he looked at me and gave me an excellent definition, in fact I think it was the precise definition that is in the Encyclopedia Britannica. It turned out that this Shepard was extremely knowledgeable, he probably had a photographic memory, but he was not particularly wise. On the bright side I really liked Alonissos, so I eventually bought this land and have gradually made it my home. Yes for a long time now, I used to travel a great deal all round the world you know, teaching and lecturing and currently I am a professor at the Kiev Medical Academy, Medical Faculty of the Basque University in Spain, and the University of Medicine in Moscow, but I do not travel much any more so I do my courses by video mostly. But this has been my base for years, and we therefore built the International Academy of Classical Homeopathy here on Alonissos. Yes. My aim is to provide these official health specialists and practitioners with a very powerful tool with which to combat or prevent disease and to help their patients get well……. and homeopathy is very difficult to learn, even more so than medicine. 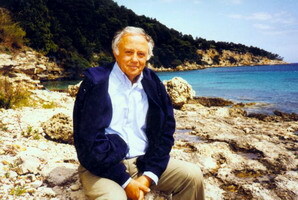 With the growth of homeopathy as a successful method, people are no longer suspicious about it; however there are many charlatan practitioners and teachers who are appearing to fill a need since there are too few properly qualified homeopaths… It is my strong belief that homeopathy’s eventual downfall could occur mainly due to a number of ”creative distortions” that are injected into the main body of knowledge by the ”imagination” and ”projections” of some ”modern teachers’ of homeopathy. Since many of our students are receptive to such myths and stories concocted by flights of wild imagination, many so-called teachers have risen to fill this gap. Believe it or not, there is a Berlin Wall remedy! (He looks on incredulously) And some teach that if you look like an animal you need an animal-based remedy; others go so far as to think that if you write the potency and name of the remedy on the bottle, it instills the given attributes (he chuckles in disbelief). After many years of work we have finally managed to create a Postgraduate Degree for medical students to learn homeopathy in the University of the Aegean, based in Syros (http://www.syros.aegean.gr). No not at all, although this is my policy. 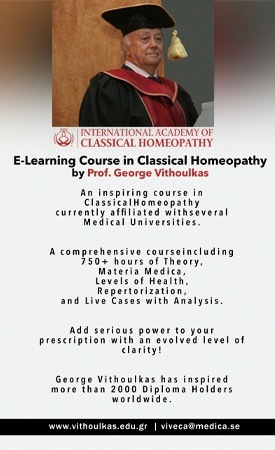 I believe that after proper 4-5 year training in a good homeopathy school, any qualified individual may practice. In your opinion, what lies behind the British Medical Association’s insistence in England that homeopathy should be cut from the National Health Service, since it is an unproven science? As I mentioned earlier there are unfortunately some practitioners who are not properly qualified and also some who make claims that are just not based on reality, for instance – that homeopathy can be used as a form of vaccine for epidemic – which is simply not true as every individual needs a different homeopathic remedy specific to their case. So these claims bring the entire practice into dispute. That’s one of the reasons; the other is that homeopathy is becoming the medicine of the new millennium, so doctors and especially pharmaceutical companies (with multimillion dollar profits) are feeling very threatened (homeopathy is non-chemical and inexpensive), so this is why they attack homeopathy. It is not coincidental to note, however, that countless medical doctors who were asked to examine the principles and effectiveness of homeopathy, on seeing the results and learning more, have become staunch supporters of this method.